(of a country) withdraw from (a colony), leaving it independent. 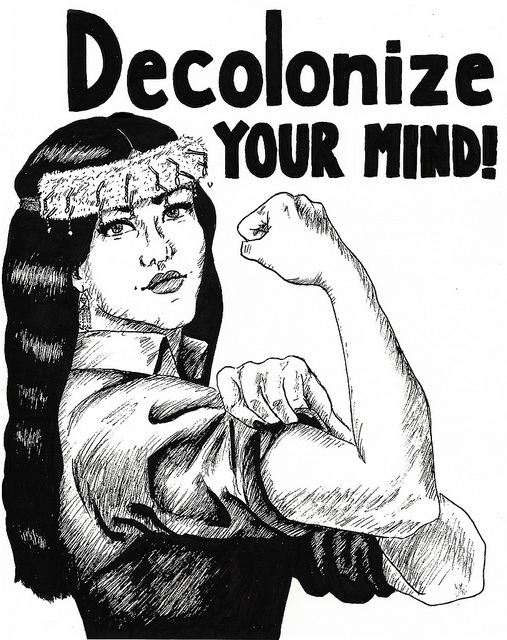 I notice a lot of talk on “decolonizing”. We must decolonize, people say. HashtagDecolonize. Street art murals with a Native woman standing proud with the word “Decolonize” defiantly scrawled on the bottom. I knew the dictionary version, and I liked the idea of it. It’s a challenging, powerful word. But as an Indigenous person, I didn’t know how to apply it to my everyday life. How are we supposed to withdraw from colonization when it permeates through our entire way of life, and has been doing so since colonists stepped foot onto the New World? How does an entire group of people literally withdraw from a colony? I found that the answers to my questions were simpler than imagined, and not as literal. 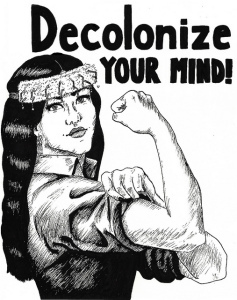 The decolonization of a physical group of people starts in the mind, in the self. Whether it begins with one person or one thousand is inconsequential; the fact that it does happen is a testament to our innate power. As Native people living in the contemporary world, our resistance to colonial ways can manifest itself when we practice our old medicine traditions. I remember one time years ago, when I was still thinking with a colonized mind. Someone close to me was talking about a certain plant our people would use for healing. I commented on how amazing it was that our people always knew the right technique for any ailment, and wondered how it came to be. They then explained to me that it was a knowledge we always had, and that it had been passed onto us by the very first beings. It made sense; since we have been here since time immemorial, we have always known how to use the land around us. Every tree, every plant, every animal. They are beings, like us. The First People gave our ancestors their deepest secrets and themselves in order for us to survive. To me, that has made our relationship sacred. With something as sacred as this exchange, it is an act of treason when we abandon the beings that gave us life. Abandonment is akin to colonization, which is akin to death; when we shun our old medicinal ways for colonial medication, we are committing an act of cultural genocide. Why leave traditional healing when it has been aiding us for centuries? Dr. Bonnie Duran stated that the promotion of Indigenous medicine and treatment “is often effective cultural revitalization”. And I think she is right. 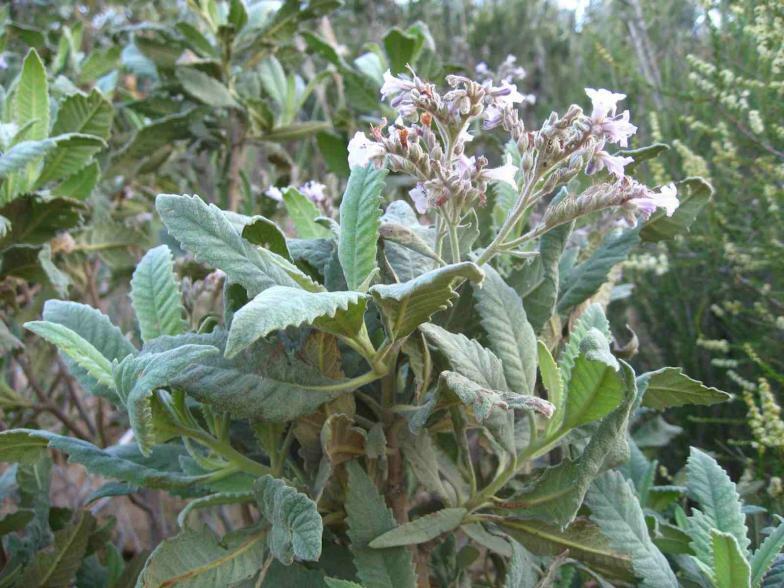 We need to get back to knowing our plants, our other people; Yerba Santa, for example, was a medicinal plant for sore throats used by Indigenous people from California down to Mexico. The transition away from Western medicine might seem useless to some, but hear me out: When my Great Aunt Betty was a child, she had a deadly kidney infection. Western doctors told her she had no chance. Her father (my great Grandfather) knew of a swamp root on our rez, and gathered some for her to make a tea. With this alone, I can proudly say my Great Aunt was cured, and is presently a healthy eighty-year old woman. Another herb I will testify to: Yarrow, Achillea millefolium. I had an ingrown toenail, not the most comfortable feeling while walking. Something had to be done. A fellow tribal member suggested the petals of Yarrow, and spoke highly of its regenerative properties. I found that Yarrow promotes the rebuilding of white blood cells, which in turn aids inflamed skin on the body. After applying yarrow once a day for three days, the irritated skin around my toe had deflated, thanks to this astringent. I was overjoyed; I had defeated my ingrown toe, and more importantly, I had defeated colonialism by resorting to a traditional cure instead of a Western cure. Some have questioned the validity of traditional herbs, and instead live by Dayquil, made of artificial ingredients. I ask: is this truly better than an all-natural plant like Yerba Santa? Would our ancestors pass down this healing knowledge since the beginning of time if it didn’t work? If the knowledge wasn’t curing, it would have never been passed on in the first place. And don’t we trust that our first beings bestowed this knowledge to us with the intentions of love and vitality? Even if the traditions are not new, their validity and benefits still stand the test of time. 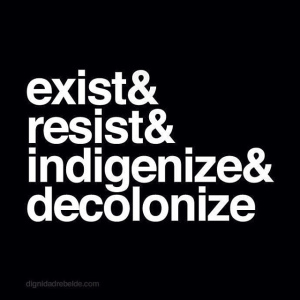 Traditional healing is an act of decolonization that allows us to stand firmly on our land while withdrawing from the clutches of assimilation. Decolonizing our medicine not only heals our physical ailments; it has the power to heal our mental and social ones as well. Too long we have had it ingrained in us that our old ways are over, that they are inferior to Western ways. Relying on our traditional ways can implant self-sufficiency back into our people; it is a way of taking back the power to heal ourselves, without colonial ideologies. Decolonization is a movement that can instill a sense of confidence back into our ancestral ways, and ultimately our people. 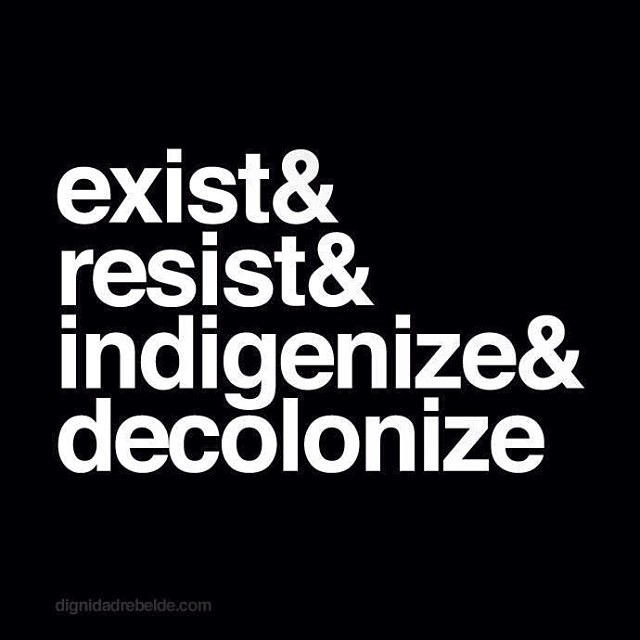 Decolonizing is our right to dissent, as an act of self-preservation. Hey Misha, I’m so sorry I’m only getting back to you now, I just got this comment! I mostly only have books for California traditional medicine, since that’s where I’m from, but I can definitely recommend Indian Herbalogy of North America by Alma Hutchens. Thank you so much for taking the time to read the article, and let me know if you have any other questions!